Diaprepes abbreviatus (Linnaeus) is a root weevil native to the Caribbean where at least 19 additional species within the genus are known. In the Caribbean, Diaprepes abbreviatus is one of the most economically important pests. It was first reported in Florida in 1964 from a nursery near Apopka. It was presumably introduced in an ornamental plant shipment from Puerto Rico. 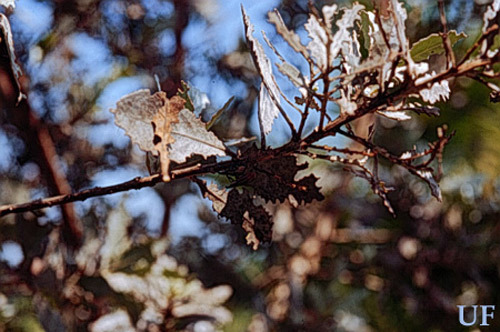 Since 1964, Diaprepes abbreviatus has spread over a large area of central and southern Florida where it is damaging to citrus, ornamental plants, and some other crops. It is estimated that Diaprepes abbreviatus causes about 70 million dollars in damage annually in Florida. Estimates show the weevil infests more than 100,000 acres of citrus. Figure 1. Adult diaprepes root weevil, Diaprepes abbreviatus (Linnaeus). Photograph by R. M. Giblin-Davis, University of Florida. Diaprepes abbreviatus is found in Florida, Puerto Rico, Jamaica, Dominican Republic, and the lower Antilles. At the time of introduction into Florida, Diaprepes abbreviatus was considered to be a problem only in central Florida. Currently, it is considered to be a problem in the southern two-thirds of the state. Adults: The adult weevils vary in length from 0.95 to 1.90 cm (3/8 to 3/4 inch). They are black, and overlaid by minute white, red orange, and/or yellow scales on the elytra (wing covers). These scales are often rubbed off of the tops of ridges on the elytra giving the appearance of black stripes on a light colored background. Adults emerging from pupae in the soil are armed with a pair of deciduous mandibles which break off as they tunnel through the soil to get above ground. Scars at the site where the deciduous mandibles break off are visible under a microscope. Figure 2. SEM of deciduous mandible and scar on a diaprepes root weevil, Diaprepes abbreviatus (Linnaeus). Photograph by R. M. Giblin-Davis, University of Florida. Eggs: The eggs are usually laid in an irregularly shaped cluster in a single layer. They are oblong- oval in shape and are smooth, pale yellowish-white and glistening. Eggs are about 1.2 mm (1/20 inch) long and about 0.4 mm (1/60 inch) wide. Figure 3. Diaprepes root weevil, Diaprepes abbreviatus (Linnaeus), egg mass on citrus leaf. Photograph by R. M. Giblin-Davis, University of Florida. Larvae: The larvae are white and legless reaching a mature length of about 2.5 cm (1 inch). The head capsule has variable light and dark areas. Figure 4. Larvae of the diaprepes root weevil, Diaprepes abbreviatus (Linnaeus). Photograph by R. M. Giblin-Davis, University of Florida. Figure 5. 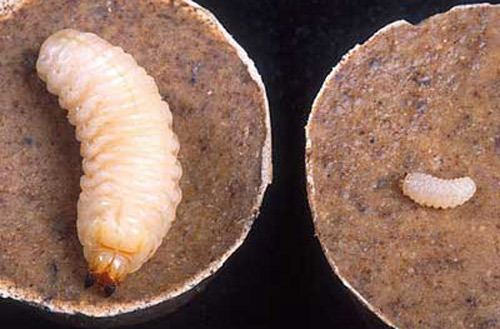 Young (right) and older (left) larvae of the diaprepes root weevil, Diaprepes abbreviatus (Linnaeus), on cakes of an artificial diet developed by the USDA-ARS. Photograph by Peggy Grub, USDA. A single Diaprepes abbreviatus female can lay up to 5,000 eggs in her three to four month long life. Eggs are laid in clusters of 30 to 265 and enclosed within leaves that have been folded and glued together, or within two leaves glued together. 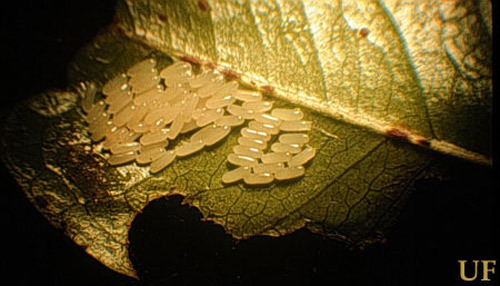 In seven to eight days the neonate larvae emerge from eggs, leave the cluster and fall off of the leaves onto the ground. The larvae then enter the soil and search for and feed on the roots. After feeding for several months, the mature larvae pupate in the soil. Adults emerge from the soil, seek a host and mate as conspecifics gather on the host. The complete life cycle varies in time depending on nutritional and environmental factors. Although adults can emerge year round, their primary emergence period is May through October and November in central Florida. It is suspected that their seasonality in South Florida is quite different because of the similarity with the Caribbean, where it can be found throughout the year. Adults do not fly far from the spot where they emerged from the soil (estimated to be less than 300 m). Therefore, long distance dispersal is through the movement of contaminated soil and containerized plants containing potentially all life stages of the weevil. In addition, soil residues on vehicles may be contaminated with larvae. Diaprepes abbreviatus has a wide host range, attacking about 270 different plants including citrus, sugarcane, vegetables, potatoes, strawberries, woody field-grown ornamentals, sweet potatoes, papaya, guava, mahogany, containerized ornamentals, and non-cultivated wild plants. Notching along the margins of young leaves is a telltale symptom of the presence of Diaprepes abbreviatus adults, or other related root weevils. However, other pests such as grasshoppers and caterpillars may produce similar damage. Therefore, it is best to look for a sign, such as the pest doing the damage. Look for Diaprepes abbreviatus adults during the day on the foliage. Shaking the plant may aid in detection as adults fall off of the plant onto the ground. A light colored piece of canvas placed beneath the plant before shaking is useful. 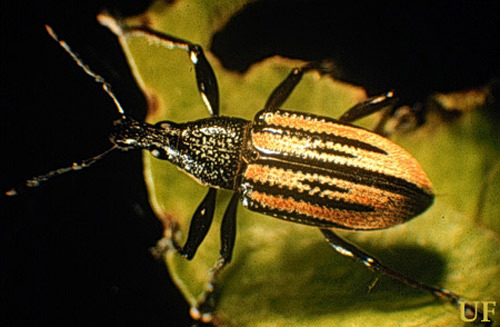 Do not look immediately after a heavy rain, which usually knocks weevils off of the plant. Figure 6. Adult diaprepes root weevil, Diaprepes abbreviatus (Linnaeus), damage - notching on leaves. Photograph by Jorge Pena, University of Florida. 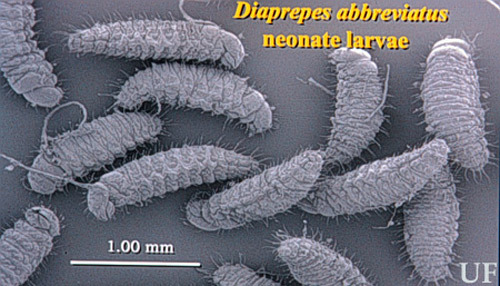 The larvae of Diaprepes abbreviatus are found in the soil where they feed on the roots of the host. They will often girdle the taproot, impeding the ability of the plant to take up water and nutrients resulting in plant mortality. 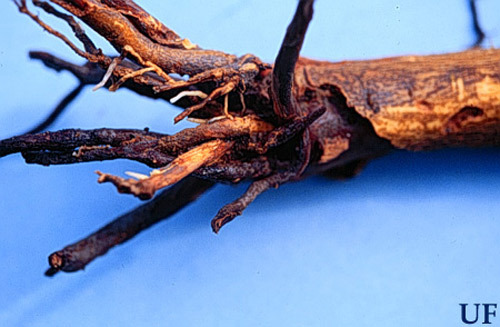 In addition, this type of injury provides an avenue for root rot infections by Phythophora fungus. Young hosts can be killed by a single larva while several larvae can cause serious decline of older, established hosts. Because larvae are below ground, it is difficult to detect them before decline of above ground potions of the host is observed. Figure 7. Damage to citrus tree roots by larvae of the diaprepes root weevil, Diaprepes abbreviatus (Linnaeus). Photograph by Jorge Pena, University of Florida. Parasitism of Diaprepes abbreviatus larvae by other insects is lacking, probably because of the location of immatures in the soil. However, eggs are more or less exposed. A wasp, Tetrastichus haitiensis, parasitic on eggs of Diaprepes abbreviatus has been released in the U.S., but has not proven effective at reducing weevil populations in the field. Another parasite, Ceratogramma etiennei, also attacks weevil eggs, but its potential for reducing weevil populations in the field needs to be determined. 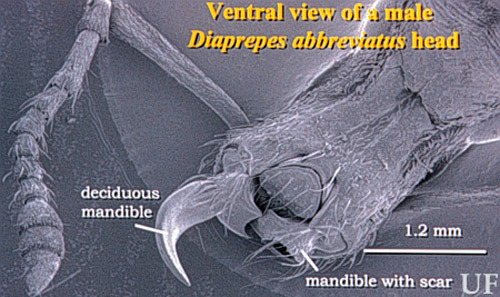 There are several general predators that will attack Diaprepes abbreviatus. These include a predatory stink bug, Euthyrhynchus floridanus (L.), the regal jumping spider Phidippus regius, and several species of ants. Ants are predatory on weevil eggs and neonate larvae. However, neonate larvae produce a chemical that is repellent to ants. A new species of nematode, Steinernema riobravis, offers potential control of Diaprepes abbreviatus larvae. This beneficial nematode applied to the soil enters weevil larvae releasing a plug of mutualistic bacteria which multiples in the larva's body cavity causing septicemia. The nematodes feed upon the decomposing host cadaver. Weevil larvae die within 24 to 48 hours following infection by nematodes, while nematodes continue to grow and mate. Female nematodes release infective juveniles which go out and find other host larvae in the soil. However, this product is no longer recommended due to poor quality control. Three species of egg parasitic wasps from the Caribbean, are being released in five South Florida counties to control Diaprepes abbreviatus. Early tests indicate the wasps are providing effective control of the weevil. The three parasites are Quadrastichus haitiensis, Ceratogramma etiennei and Aprostocetus vaquitarum. The University of Florida and the Florida Department of Agriculture and Consumer Services, in cooperation with various grower organizations have released more than 363,000 wasps of the species Ceratogramma etiennei since 1998, more than 160,000 Quadrastichus haitiensis since 1999 and more than 50,000 Aprostocetus vaquitarum since 1999. Ceratogramma etiennei wasp parasites have attacked Diaprepes eggs in Miami-Dade County. Quadrastichus haitiensis parasites have been found in weevil eggs in Miami-Dade, Glades, Hendry and Polk counties, and Aprostocetus vaquitarum parasites have been recovered from weevil eggs in Indian River County. Findings indicate wasp parasites are becoming established in the state. In fact, since their introduction, the wasps have begun to parasitize 35 percent to 100 percent of Diaprepes root weevil eggs in different crops. During the 1960s, chlorinated hydrocarbons such as aldrin and chlordane were used in Puerto Rico as the primary method of Diaprepes abbreviatus control. These compounds were applied to the soil prior to egg hatch to intercept neonate larvae as they entered the soil. These persistent materials are no longer available for use. Consult the following University of Florida Pest Management Guide for the latest recommendations. Other methods tested include the use of horticultural oils that effectively separate leaves that have been stuck together to protect eggs. When the leaves are separated, eggs desiccate or are more subject to predation and parasitism. Oils also prevent females from gluing eggs to leaves. In addition, registration of an insect growth regulator has been approved by EPA. By using the insect growth regulator with a spray oil, egg viability has been reduced by as much as 95 percent. Some of these products, however, need to be tested in ornamentals and tropical fruit crops for phytotoxicity and efficacy. soil applications of chemical insecticides for control of neonate larvae. Currently, sanitary-based containment is practiced as the means to limit the spread of Diaprepes abbreviatus. Movement of equipment and materials that might spread the pest from infested to noninfested areas should be restricted. Examples of materials that might harbor viable stages of the weevil include all soil, plants, leaves, grass clippings, sod and stumps. Beavers JB, Selhime AG. 1978. Flight behavior and dispersal of Diaprepes abbreviatus. Florida Entomologist 61: 89-91. Duncan LW, Stuart RJ, Gmitter FG, LaPointe SL. 2009. Use of landscape frabric to manage Diaprepes root weevil in citrus groves. Florida Entomologist 92: 74-79. Mayer RT, Hunter WB, Lapointe SL, McKenzie CL, Shatters R, Shapiro J, Doostdar H, Weathersbee AA. Diaprepes root weevil: recent advances at the U.S. Horticultural Research Laboratory, Ft. Pierce. Part I. Citrus & Vegetable. 2001. July: 9-12. Mayer RT, Hunter WB, Lapointe SL, McKenzie CL, Shatters R, Shapiro J, Doostdar H, Weathersbee AA. Diaprepes root weevil: recent advances at the U.S. Horticultural Research Laboratory, Ft. Pierce. Part II. Citrus & Vegetable. 2001. August: 8-13. Schroeder WJ. 1981. Attraction, mating, and oviposition behavior in field populations of Diaprepes abbreviatus on citrus. Environmental Entomology 10: 898-900. Simpson SE, Nigg HN, Coile NC, Adair RA. 1996. Diaprepes abbreviatus (Coleoptera: Curculionidae): Host plant association. Environmental Entomology 25: 333-349. Wolcott GN. 1936. The life history of Diaprepes abbreviatus, at Rio Piedras, Puerto Rico Journal of Agriculture University of Puerto Rico 20: 883-914. Woodruff RE. 1968. The present status of a West Indian (Diaprepes abbreviata (L.)) in Florida (Coleoptera: Curculionidae). Florida Department of Agriculture and Consumer Services, Division of Plant Industry Entomology Circular 77. Photographs: R.M. Giblin-Davis and J.E. Peña, University of Florida; Peggy Grub, USDA. Publication Date: February 1998. Latest revision: November 2012. Reviewed February 2019.